Nestled amidst rolling hills of lush green tea and conveniently located just off National Highway 37 on the Guwahati Dibrugarh Sector IORA is the newest luxury resort at Kaziranga. 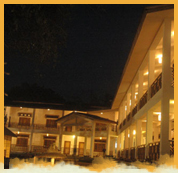 IORA is a perfect blend of the tranquility of Assam and the comforts of a modern Luxury resort. IORA offers a serene, rejuvenating experience with liberal doses of warm Assamese hospitality and supported by the best in state-of-the-art amenities. This 20 acre resort with 4 star amenities, landscaped gardens, a small tea garden for the "tea" experience and lush forest views, is the perfect place to stay in Kaziranga National Park. Whether you are sipping a cocktail on the private balcony of one of the 42 spacious rooms or chilling out in our beautiful swimming pool with a water cascade, you will find total relaxation. Satisfy your taste buds at our multi cuisine restaurant or at the open deck cafe by the pool or enjoy the in-pool bar and Jacuzzi. Shoot the cue ball on our vintage billiards & pool table, enjoy a game of table tennis, play a host of board games or immerse yourself in our DVD and book libraries. Relax as the skillful hands of our professional therapists put you at ease with traditional massages in our Spa & Wellness Center, or groom and pamper yourself at our beauty salon or workout in our well equipped fitness centre. IORA is the perfect place for conferences with our generously-sized conference facilities, which can accommodate up to 200 people. * 42 aesthetically designed rooms with 19 Deluxe rooms, 15 Luxury rooms, 4 Supreme rooms and 4 Suites.